If this card is Special Summoned: You can target 1 face-up monster your opponent controls; it cannot attack until the end of your opponent's turn. 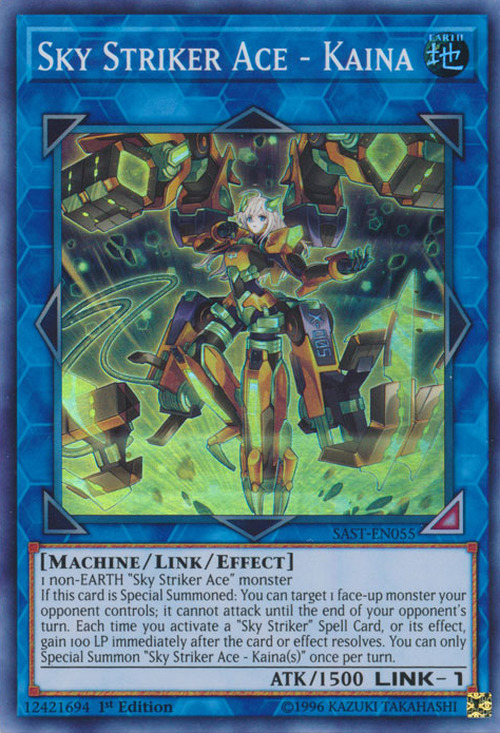 Each time you activate a “Sky Striker” Spell Card, or its effect, gain 100 LP immediately after the card or effect resolves. You can only Special Summon "Sky Striker Ace - Kaina(s)" once per turn. 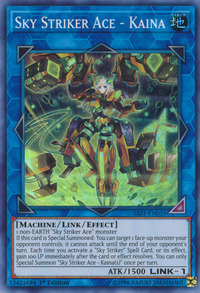 This monster is the evolved EARTH form of Sky Striker Ace - Raye. This monster's serial number is X-005, carved within the left side of her waist armor.